We currently have several working engines using the Wiseman mechanism. 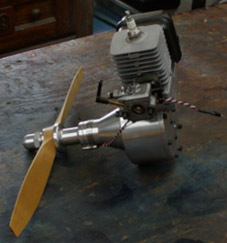 Preliminary tests have been conducted to compare fuel usage of the stock 30cc engine compared to an identical engine modified only for the Wiseman Mechanism. Results disclosed that the stock engine ran 422.4 seconds on 2 oz. fuel (100:1 gas/oil mix) while the WISEMAN engine ran 861.6 seconds, with an identical amount of fuel, an improvement of 100%!!! The Wiseman Mechanism also resulted in superior emissions test results.